Stripes. Every girl’s gotta have some in her closet! I love the cool, boyish vibe of this striped shirt from J.Crew. 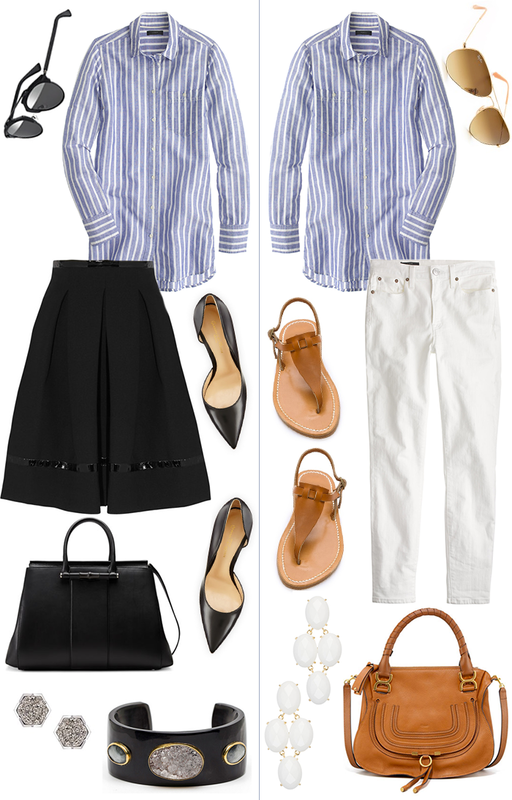 Simple, chic and wearable from work to the weekend! Since I don’t work at an office, I’ll definitely be pairing with shorts (want these!) and white jeans this spring/summer, but it looks just as cute with a pencil or a-line skirt and pumps for work! How would you style it? This shirt is the best, I love mine. Both looks are great but I love, love, love that black skirt! Pure classic. Love the fabric of that striped shirt, such a pretty look! Great post! Love the work version best. Such a classic and perpetually flattering top! Loving both ways you styled it here. That black skirt is so timeless and feminine. And white jeans are an ideal spring/summer staple! You know I love the pants look any day and all day with that Chloe Marcie! Love how you transitioned this classic piece so seamlessly!